The Fourth » PILLOW FIGHT! Come on guys, Ecta just wants to have a slumber party! I’ll leave it up to you whether she popped in and out or if she just stayed there like a taxidermied deer head watching them sleep all night. I like the artistic subtext on this. 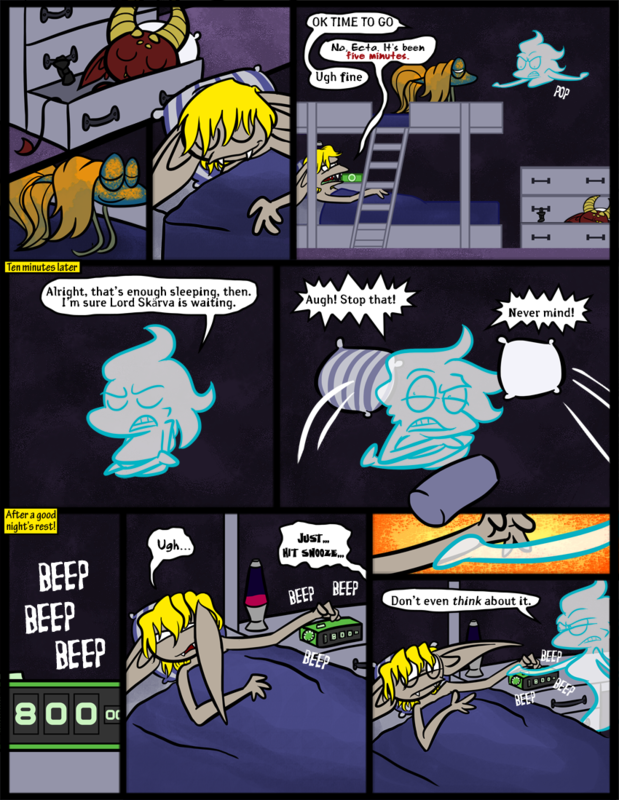 By contrasting the innocence and adorableness of the first panel coupled with the reference in the description to a creepy ghost watching people sleep like a deer head, you get a spine-shivering tale. Oh, who am I kidding. LOOKIT SPIKE’S CUTE LITTLE FLOPPY-FIN! Spike? close enough. But yeah, he comes with his own blanket! Sort of! Oh dear god you’re right–that’s just adorable! I love how they live in the MAGICAL land of Ideanu, and yet they have things like alarm clocks, lava lamps, and telephones. I’ve always liked worlds where magic and at least somewhat-modern technology exist side by side. After all, it tends to happen that not everyone can use magic. Well, to be fair, she really hates things going through her without her permission. Some ghosts really mind that and some don’t at all. She definitely stayed like a taxidermied deer head. Because she loves them. Secretly. She really was just looking for an excuse to touch Floyd’s arm. Please, please, please let it be Christmas season in Ideanu! It’s certainly the season for a generic winter holiday that is definitely NOT Christmas, but resembles it quite closely!